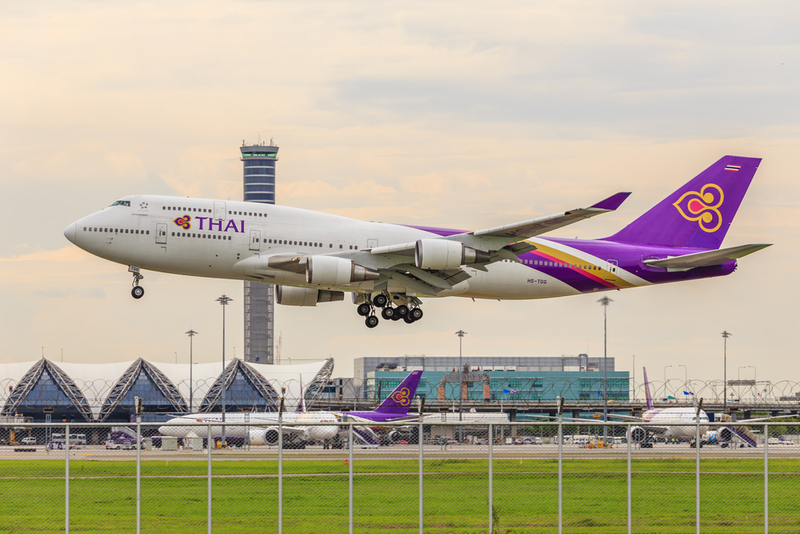 Thai Airways partners with 2 transferable point programs to give you a couple of ways to earn Thai Airways Royal Orchid Plus miles: Citi ThankYou Rewards and Marriott Bonvoy. If you’re a Thailand resident, Thai Airways offers a few branded cards that allow you to earn miles directly with your credit card spending. For U.S customers, American Express and Citi are the 2 most recognizable Thai Airways credit card partners. However, none of these co-branded offerings are compelling due to the lack of a welcome bonus, so we recommend passing on them for now. If you’re looking for ways to earn Thai Airways miles with credit card spending, check out the options below. Citi flies under the radar among the 5 main transferable point programs for good reason: the bank simply doesn’t offer that many credit cards that both earn Citi ThankYou points and come with compelling welcome offers. While it can be challenging to earn Citi ThankYou points from your credit card spending, the upside is that the Citi ThankYou program offers regular bonuses when transferring points to its airline partners. The Marriott Bonvoy program is interesting in that it’s a hotel program that allows you to earn Marriott hotel points that can be transferred to its airline partners. Keep in mind that transferring Marriott points to Thai Airways can take up to 10 days. For most people, this is a deal breaker. Yes, Marriott members receive a 5,000-point bonus for every 60,000 Marriott points that are transferred to an airline partner — but waiting 10 days doesn’t always make sense if you’re looking to snag an in-demand award seat. If you do want to take the chance of transferring miles and hoping your award flight is still available, the 60,000 Marriott Bonvoy points that you transfer to Thai Airways become 25,000 Thai Airways miles including the 5,000-point bonus (60,000 / 3 = 20,000 * 25% bonus = 25,000). 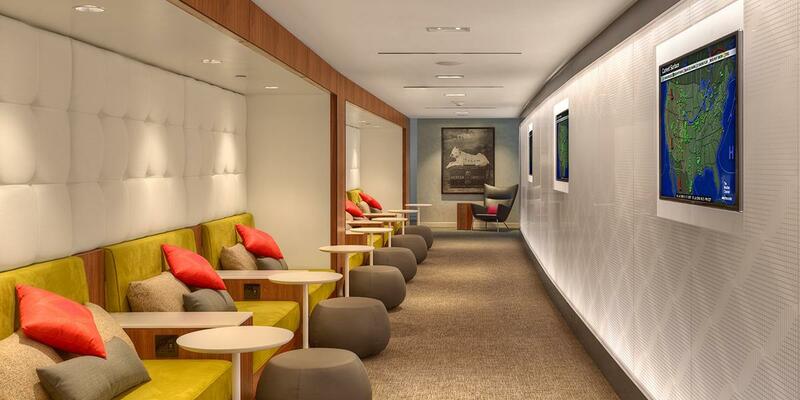 Thai Airways partners with another big hotel program, the World of Hyatt. However, the transfer ratio when converting Hyatt points into Thai Airways miles isn’t favorable, at 2.5 Hyatt points to 1 Thai Airways airline mile. For this reason, we don’t recommend converting Hyatt points into Thai Airways miles unless you are looking to top off an account or are in a serious bind. Operating out of its hubs in Bangkok and Phuket, Thai Airways is the flag carrier airline of Thailand. Thai Airways doesn’t fly nonstop to the U.S., but its Bangkok hub has flights to destinations across Asia, Australia, and Europe. 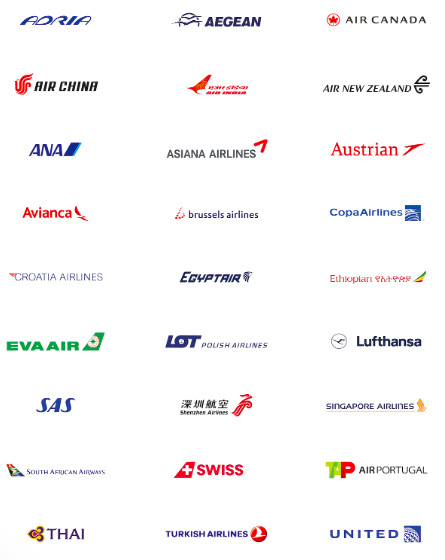 Along with airlines like Air New Zealand, ANA, Avianca, Lufthansa, and United, Thai Airways is a Star Alliance member. This means Thai Airways miles can be redeemed for flights on airlines across the Star alliance. The frequent flyer program of Thai Airways is called Royal Orchid Plus, and it can potentially provide value when flying on a Thai Airways or Star Alliance partner flight. Elite status for Royal Orchid Plus members is awarded based on the number of Qualifying Miles (Q Miles) earned in the evaluation period. Q Miles are calculated based on 2 factors: 1) the fare class of the ticket, and 2) the distance flown. Bottom Line: Thai Airways requires its members to earn a certain number of Q Miles for its lowest elite status. For its 2 highest elite tiers, members will need to earn a certain number of Q Miles as well as fly a certain number of Thai Airways flight segments. Membership in the Royal Orchid Plus program is free; you can set up an account by completing this application. When your application has been confirmed via email, your Royal Orchid Plus membership provides you with the opportunity to earn and redeem Q miles in the frequent flyer program. To access your account, provide your Member ID and PIN on the login page. Thai Airways login screen. Image courtesy of thaiairways.com. Hot Tip: Thai Airways mirrors many airlines, in that you don’t need to log in to your account see the number of miles required to book an award flight. Q Miles are valid for 3 years. Miles earned in each quarter and not redeemed expire at the end of the corresponding quarter 3 years later. Thai Airways elite status. Image courtesy of thaiairways.com. The Thai Airways Royal Orchid Plus program has 3 elite tiers that members can earn. For flyers who can earn the higher elite tiers, Thai Airways will award you with a host of benefits that focus on lounge access, removal of mileage expiration, and complimentary upgrades. If you’re interested in a deeper dive, check out the full list of program benefits for more information. Bottom Line: Thai Airways is enticing for those who want elite status with lounge access, removal of booking fees, no mileage expiration, and complimentary upgrades. 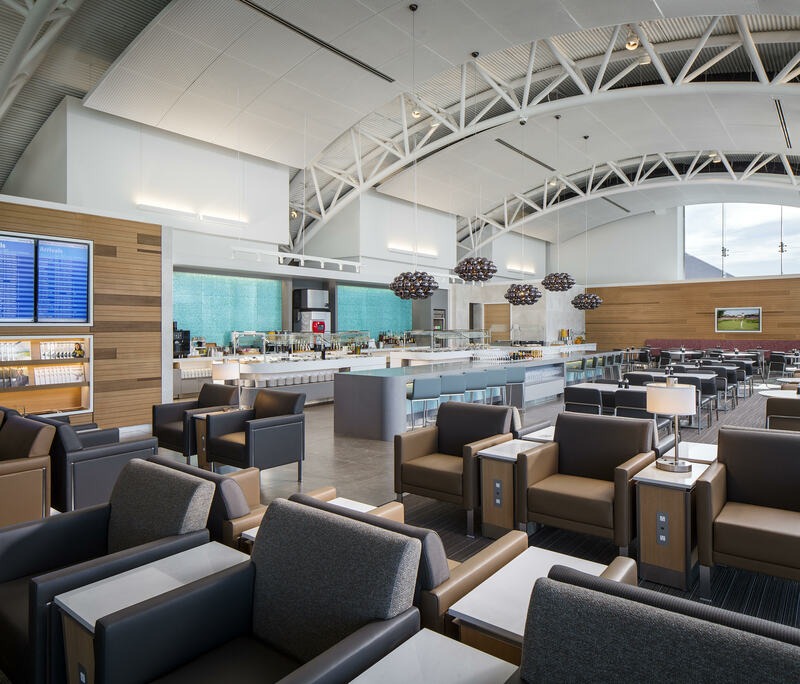 The Platinum tier comes with first class lounge access, a 10,000-mile tier bonus, waiver of booking fees, miles that don’t expire, and complimentary upgrades as perks members can attain. Below the Platinum tier is Gold – it has interesting benefits, but it’s helpful to ask yourself if the benefits offered at each elite tier are valuable to you. If you decide to earn elite status, try to earn Platinum status as the benefits at this level will give you the most in returned value. Hot Tip: Other Star Alliance member airlines like United Airlines will provide more elite status value for travelers based in the U.S.
Elite status in the program is earned by the number Q Miles flown. Q Miles are determined by the distance flown plus any additional class of service miles. Note that you must earn Thai Airways elite status from flying — miles earned from credit card spending do not count as Qualifying Miles. Silver status requires 10,000 Q Miles during a 12-month period, or 15,000 Q Miles during a 24-month period. Your Silver status expires at the end of the 12-month or 24-month period, whichever is applicable, unless you earn it again during that time period. Every time a member attains or retains Silver status, a 3,3,000-mile bonus is credited to the member’s account. Earning Gold status requires 50,000 Q Miles during a 12-month period, or 80,000 Q Miles during a 24-month period. In addition, you’ll need to fly 40 Thai Airways international flight segments in any 12-rolling-month period. Gold status expires at the end of the 12-month or 24-month period, whichever is applicable, unless the status is earned again during that time period. When a member attains or retains Gold status, a 5,000-mile bonus will be credited to the member’s account. The highest elite status, Platinum, requires 80,000 miles flown on Thai Airways Royal First Class or Royal Silk Class flights every 12 months on a rolling basis. If you earn Platinum status again, you’ll earn a 10,000-mile bonus credited to your account each time. Bottom Line: Unlike some award programs, Thai Airways doesn’t offer a way for its customer to earn elite status from credit card spending. Thai Airways partners with 2 of the 5 transferable point programs: Citi ThankYou Rewards and Marriott Bonvoy. Unfortunately, they don’t partner with the other 3 other transferable point programs (Amex Membership Rewards, Chase Ultimate Rewards, and Capital One). It’s important to note that neither Citi ThankYou nor Marriott Bonvoy transfer times are instant. Citi ThankYou point transfers to Thai Airways take 4 days, and Marriott Bonvoy point transfers take 10 days. Hot Tip: With partner transfer times ranging from 4-10 days, keep the booking timeline in mind if you are eyeing an award flight! Thai Airways’ Earn Miles page makes it incredibly easy to see the miles that you’ll earn for a Thai Airways flight. The airline uses booking class and flight distance to determine the number of miles that you’ll earn for each trip. There is no elite status bonus in addition to the base miles that you’ll earn, though you can earn more miles based on the fare class that you book. 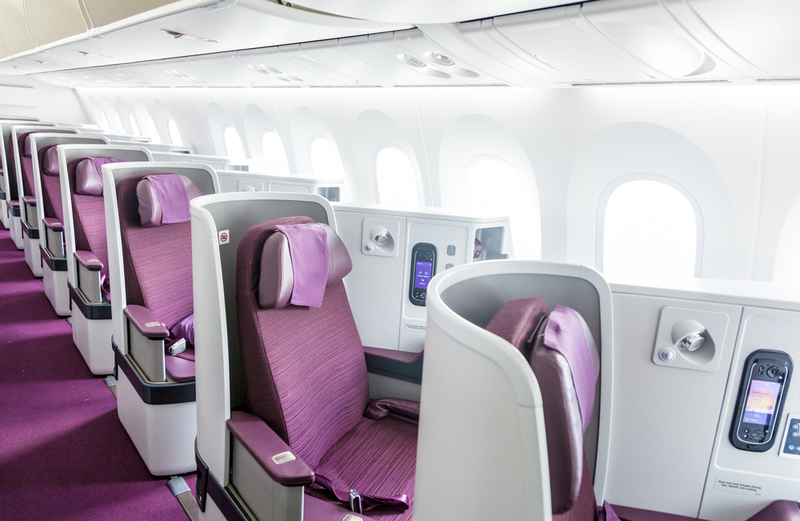 Thai Airways flights booked in first class, Silk Class, and premium economy earn 150%, 125%, and 110% miles of the distance flown, respectively. Star Alliance partners. Image courtesy of avianca.com. If you’re looking to credit Star Alliance partner flight miles earned to Royal Orchid Plus, check the airline page of the operating airline to see how many miles you’ll earn. In addition to the Star Alliance, Thai Airways has a partnership with Nok Air that allows members to earn Q Miles on Nok Air flights. Citi ThankYou and Marriott Bonvoy offer a number of cards that earn points you can transfer directly to Thai Airways. If you’re using Citi ThankYou points, some of Citi’s airline partners have a regular transfer bonus, which allows you to receive even more value for the points you earn. As far as Marriott Bonvoy credit cards, remember that you’ll receive a 5,000-mile bonus for every 60,000 points transferred to an airline partner like Thai Airways. Marriott Bonvoy points transfer to Thai Airways at a 3:1 ratio, meaning that 60,000 Marriott points become 25,000 Thai Airways miles with the 25% airline transfer bonus. In addition to flying and credit card spending, Thai Airways provides its members with a couple of additional ways to earn Q Miles. First, you can check out the Thai Airways Facebook, Twitter, and Special Offers pages for additional places to earn Thai Airways Q Miles. Second, you can utilize Thai Airways’ car rental and hotel partners, where you’ll earn miles with every car rental and hotel stay. Hot Tip: If you want to learn more about how to earn miles, we have an entire post on the best ways to earn Royal Thai Orchid Plus miles. Royal Orchid Plus members have a number of ways to redeem miles, but you’ll receive the most value by using your miles to book award flights. Thai Airways uses a one-way and round-trip award chart when redeeming miles to fly on its own flights. Simply click the graphic for one-way or round-trip to see the number of miles you’ll need to book an award flight based on your origin and destination. Thai Airways business class. Image courtesy of Komenton via shutterstock.com. After you’ve had the opportunity to review the Thai Airways award chart, check out the Thai Smile and Star Alliance award charts for more ways to use your miles. The chart below shows the number of miles required for a one-way Star Alliance partner flight. 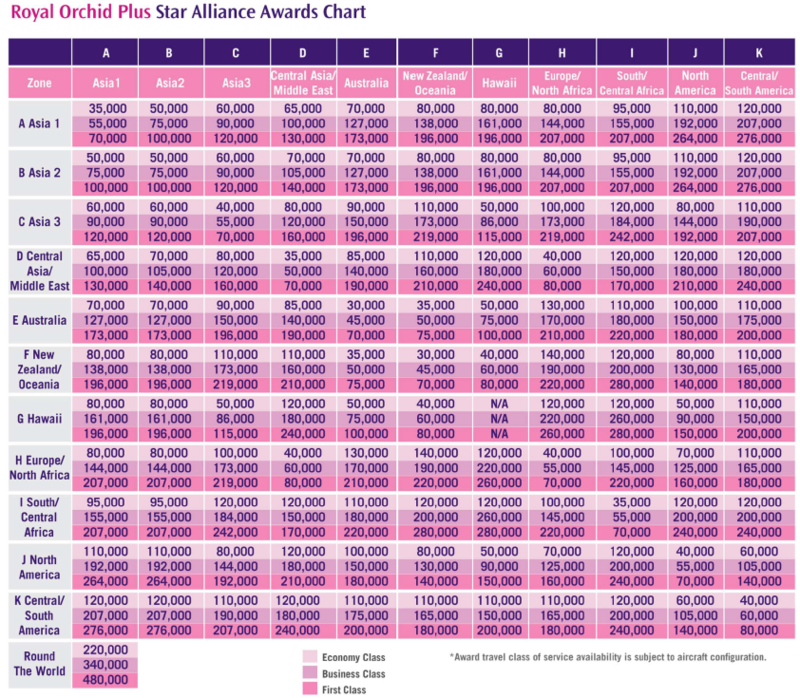 Thai Airways Star Alliance award chart. Image courtesy of thaiairways.com. Hot Tip: Thai Airways doesn’t provide the most value amongst the Star Alliance airlines for award flights. Consider earning and redeeming miles in the Asiana Airlines, Avianca, Singapore Airlines, and United Airlines programs instead. As mentioned above, Thai Airways uses 1 chart for its Star Alliance airline partners and another chart for its Thai Smile partnership. Head to the respective award chart page to determine how many miles you’ll need for your award flight using Thai Airways Q Miles. Thai Airways is not the best website for searching Star Alliance award flights when using Thai Airways Q Miles. Instead, use the United and Aeroplan websites to search for award availability. United tends to be the most accurate and reliable, but it’s best to use both to ensure you’re seeing all of the award availability. As of today, award flights can only be booked online for round-trip flights departing from Bangkok. This means you’ll need to call Thai Airways at 800-426-5204 to book a partner flight not departing from Bangkok. Hot Tip: For partner airline flights outside of the major alliances mentioned above, consider using Expert Flyer to locate your award flight, and then calling Thai Airways to ask them to search for the same award space you see on Expert Flyer. What is the Royal Thai Orchid Plus program? Is it worth it? What are the benefits? The free frequent flyer program of Thai Airways is called Royal Orchid Plus. This award program allows members to earn miles and elite status, as well as use Thai Airways Q Miles for an award flight. Earning Silver or Gold status is based on the number of Q Miles earned in a rolling 12-month or a 24-month period. All bonus and promotional miles are excluded from elite status qualification. Thai Airways is a Star Alliance member, which means Royal Orchid Plus members that earn Q Miles can redeem those miles for flights on both Thai Airways and other Star Alliance partner airline flights. What other programs partner with Thai Airways Royal Orchid Plus? Can I transfer miles to them? Thai Airways has a number of airline, credit card, hotel, and car rental partners. Using Q Miles to book award flights will yield the most value for your miles, but you can redeem Q Miles for hotel stays, excess baggage fees when flying Thai Airways, lounge access when flying Thai Airways, and lifestyle award partners. Members can’t directly transfer Q Miles to an airline partner, but you can use your miles to book a Thai Airways or partner airline flight. What is the Thai Airways Royal Orchid Plus login? Access your account by heading to the Thai Airways login page. Where can I sign up for Thai Airways Royal Orchid Plus? Enrollment is quick and free by completing an application. What is my Thai Airways Royal Orchid Plus number? 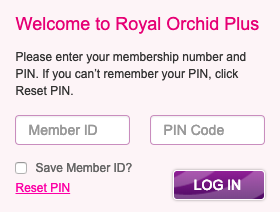 You can find your Royal Orchid Plus number by signing into your account, looking on your membership card, or through a variety of marketing emails they send you. If you can’t find it there, try using the “forgot my password” tool to reset your account so you can get in. Alternatively, try calling the customer service desk at 1-800-426-5204 24 hours a day, 7 days a week. When do miles post in my Royal Orchid Plus account? Q Miles should post in your account within 7 days after your date of travel. When do Q Miles expire? Q Miles are valid for 3 years. Miles earned in each quarter of any given year but not redeemed expire at the end of the corresponding quarter 3 years later. When does Royal Orchid Plus status expire? Elite status is valid for 12 months from the time the membership level is earned. Is there a Thai Airways credit card? Thai Airways partners with American Express and Citi, among other financial partners, but these cards aren’t that compelling due to the lack of a welcome bonus — we recommend passing for now. Can you hold an award flight with Thai Airways? Thai Airways does not allow its members to put a hold on an award ticket.